Unfurling like a medieval book of days, each page of Eduardo Galeano's Children of the Days has an illuminating story that takes inspiration from that date of the calendar year, resurrecting the heroes and heroines who have fallen off the historical map, but whose lives remind us of our darkest hours and sweetest victories. Challenging readers to consider the human condition and our own choices, Galeano elevates the little-known heroes of our world and decries the destruction of the intellectual, linguistic, and emotional treasures that we have all but forgotten. Readers will discover many inspiring narratives in this collection of vignettes: the Brazilians who held a "smooch-in" to protest against a dictatorship for banning kisses that "undermined public morals;" the astonishing day Mexico invaded the United States; and the "sacrilegious" women who had the effrontery to marry each other in a church in the Galician city of A Coruna in 1901. Galeano also highlights individuals such as Pedro Fernandes Sardinha, the first bishop of Brazil, who was eaten by Caete Indians off the coast of Alagoas, as well as Abdul Kassem Ismael, the grand vizier of Persia, who kept books safe from war by creating a walking library of 117,000 tomes aboard four hundred camels, forming a mile-long caravan. Beautifully translated by Galeano's longtime collaborator, Mark Fried, Children of the Days is a majestic humanist treasure that shows us how to live and how to remember. It awakens the best in us. Eduardo Galeano (1940-2015) was one of Latin America's most distinguished writers. A Uruguayan journalist, writer and novelist, he was considered, among other things, "a literary giant of the Latin American left" and "global soccer's pre-eminent man of letters." He is the author of the three-volume Memory of Fire; Open Veins of Latin America; Soccer in Sun and Shadow; The Book of Embraces; Walking Words; Upside Down; and Voices in Time. Born in Montevideo in 1940, he lived in exile in Argentina and Spain for years before returning to Uruguay. His work has been translated into twenty-eight languages. He is recipient of many international prizes, including the first Lannan Prize for Cultural Freedom, the Casa de las Americas Prize, and the First Distinguished Citizen of the region by the countries of Mercosur. Galeano once described himself as "a writer obsessed with remembering, with remembering the past of America and above all that of Latin America, intimate land condemned to amnesia." Isabel Allende, who said her copy of Galeano's book was one of the few items with which she fled Chile in 1973 after the military coup of Augusto Pinochet, called Open Veins of Latin America "a mixture of meticulous detail, political conviction, poetic flair, and good storytelling." "Bedtime stories, you remember? This is a book of stories for each day of the year, addressed to adults. Stories of the historical human venture. Each story half a page. Put it beside your bed and the bed of those you love." "Eduardo Galeano's winningly eccentric Children of the Days: A Calendar of Human History is packed with enough rogues and history changers to last a lifetime." "With each passing day, details of an important event-or one lost to history's selective memory-illuminate the humanity and barbarism of our species. Good and evil, beauty and ugliness, generosity and greed-all are juxtaposed to great effect.... [T]his is a heady portrait of the human story rendered in broad, though no less incisive and affecting, strokes." "Galeano's many readers will surely find this secular calendar appealing." 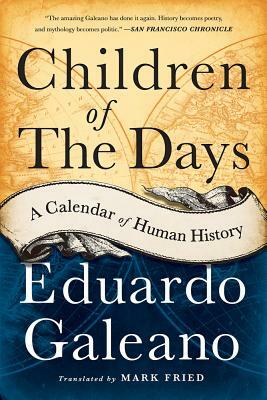 "Eduardo Galeano's Children of the Days: A Calendar of Human History is another impressive work of cogent and creative insight from a prophet who opens our eyes to the world as it is and as it could be if more of us would fight for peace, justice, and human equality." "Galeano's genre is his own - a mixture of fiction, journalism and history that, as always, is conveyed in orderly fragments of various sizes and is best understood as an outgrowth of his first midteen self-expressions as a socialist cartoonist. If you think of every short individual Galeano piece in the mammoth collection of them that comprises his life's work as a kind of verbal cartoon - or a set of variations on a verbal cartoon - then you understand both the striking singularity of his work and its innovation...Galeano's fire is unquenched. He keeps giving it to us in abundance." "It's May, but this is a Christmas kind of a book: giftable, covetable, hefty, handsome, a veritable plum pudding of a thing, its lovely midnight-blue cover designed to look as though dotted with stars, or perhaps dusted with sugar, and slathered all over with generous custardy recommendations from both Philip Pullman and John Berger... Galeano chronicles events and anniversaries from the history of oppressed nations, adding the odd dash of fictional fun and philosophical musing... The effect is dizzying, like staring up close for a very long time at the walls of Gaudí's Sagrada Família...Children of the Days is the ne plus ultra of the Galeano style and form, a triumph of his mosaic art - 365 sad and strange and shiny little fragments, placed adjacent to one another to form a vast and seemingly coherent whole...This is a book of days, not for every day but for any day." "Compelling, enlightening, tragic, hopeful, and hypnotic book: history in poetic snapshots... There are great stories in the book, pain and injustice too. And there is hope." "Eduardo Galeano is the great master of fragments and splinters, a prince of the absurdly truthful. Children of the Days, his Calendar of Human History, is an immensely varied gathering of facts and oddments and truths and stories of every kind. Underlying them all is a passionate and humane concern for the underdog, the poor, the forgotten. How this can be so funny and at the same time so moving is a great mystery." "What category to put our beloved poet-historian, historian-poet in? Galeano is truly a Scheherazade. He keeps me morally awake, while also lifting my spirits with his ability to reveal in story-form the deep, sweet humanity which rebounds even after the cruelest moments of history. Reading Galeano, I'm often reminded of Joseph Conrad's claims for what writing should do: 'art itself may be defined as a single-minded attempt to render the highest kind of justice to the visible universe, by bringing to light the truth, manifold and one, underlying its every aspect.' That is reason enough to stay morally awake!"